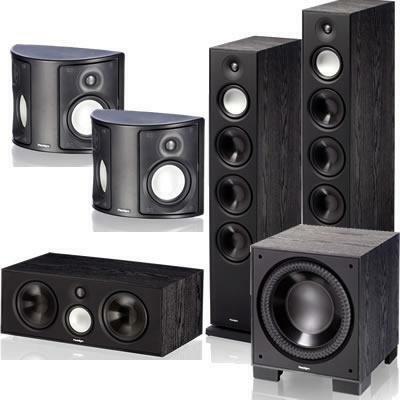 When it comes to getting value for your money, it doesn't get better than Monitor Series 7. Since its inception, the Monitor Series has been a favorite of audiophiles on a budget — with Series 7, that hasn't changed. Driver Mid Range 140-mm (5-1/2 in) S-PAL™ cone, 25-mm (1 in) voice-coil, oversize ceramic / ferrite magnets, GRIP™ chassis, separate sealed driver chamber. Driver Bass Frequency Three 165-mm (6-1/2 in) carbon-infused polypropylene cones, 25-mm (1 in) voice-coils, oversize ceramic / ferrite magnets, GRIP™ chassis. Brand/Model Specific Features Advanced S-Pal™ Satin-Anodized Pure-Aluminum Bass/Midrange Cones. Advanced Carbon-Infused Injection-Molded Polypropylene Bass Cones. Advanced S-Pal™ Satin-Anodized Pure-Aluminum Domes. Wire Mesh Tweeter Guard and WaveGuide™. Long-Travel Motor/Magnet Structures. Foam-Rubber Elastomer Surrounds. Driver High Frequency Two 25-mm (1 in) S-PAL™ dome tweeters, ferro-fluid cooled and damped. Brand/Model Specific Features Advanced S-Pal™ Satin-Anodized Pure-Aluminum Bass/Midrange Cones. Advanced S-Pal™ Satin-Anodized Pure-Aluminum Domes. Wire Mesh Tweeter Guard and WaveGuide™. Sophisticated crossovers in an affordable audiophile product. Foam-Rubber Elastomer Surrounds. Amplifier Type Ultra-Class-D™ Power Amplifier with Unique Switching Power Supply. Brand/Model Specific Features A compact footprint without compromising bass output or bass extension; Trickle-down Paradigm Reference technology … despite cone size, the NLC™ non-limiting corrugated Santoprene® surrounds help cones move huge volumes of air for bass so loud and so deep it will send the cat running for cover; State-of-the-art room-tuning technology. Don’t worry about perfect placement, put the sub where it looks best and let Paradigm’s Perfect Bass Kit™ (sold separately) dial in perfect bass; Go wireless! Paradigm’s PT-2 transmitter (sold separately) can be used with up to four Monitor subwoofers simultaneously. Warranty 5 Years for the speakers; 3 Years for the subwoofer.